Myanmar festivals are based on the traditional Myanmar calendar and dates are determined by the moon's phase. Here’s a preview of the top 7 Myanmar festivals celebrated country wide. Burmese girls perform traditional dance during closing ceremony of Myanmar New Year Water Festival | Image by Wikipedia user Htoo Tay Zar , adapted under a Creative Commons license. This Buddhist festival is usually celebrated from 13-16 April over a period of four to five days, leading towards the Myanmar New Year celebration. Water-throwing from any shape or form of vessel or device that delivers water is the distinguishing feature of this festival. Thingyan is comparable to other New Year festivities in Theravada Buddhism. Kasone festival is the pouring of water to the Bodhi tree. The festival takes place on the full moon day of Kasone; this day is also known as the Buddha’s day (because Buddha was born, and also reached enlightenment on Kasone Full Moon Day). Pilgrims pour water on the Bodhi trees in pagoda compounds to keep them fresh in the summer heat of May. The processions of men and women of all ages can be seen on the platform of local pagoda with their finest attire. Young women and men carrying earthen pots in their hands or their heads and go to pour the sacred Bodhi tree at the Pagoda platform. The festival of examination where Buddhist monks sit for an examination to test their knowledge of the Buddhist scriptures. Waso is normally held in July. This month is the sacred month for the Buddhist because it was the day when the Buddha the young prince was conceived. During Waso, monks are not allowed to make a journey lasting a night or longer and they have to stay at their monasteries. During Buddhha’s lifetime, a group of monks set out on a journey to pay their respects to the Buddha. Unfortunately, they had chosen to travel during rainy season. This was also the time when the crops and paddy stalks grow fully. The monks walked across cultivated fields, spoiling the crops and insects unintentionally. As a result, Buddha passed a law that no monk shall make a journey lasting a night or longer during the three months of the monsoon rains. Held between July and August, Wagaung is a month for alms-giving. Lots are drawn and monks will receive whatever bowl his lot falls. Each donor also draws lots and the lucky donor often receives a sum of money. The winner is overjoyed with his luck and believes he is given another chance to do good deeds of merit. So, he spends his money for yet another alms-giving ceremony. Tazaungdaing Festival | Image by Flickr user Jean-Paul Navarroi, adapted under a Creative Commons license. 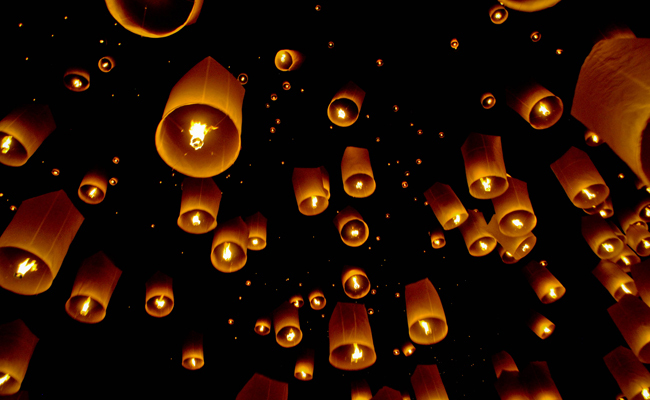 Known as the festival of lights and spelt, Tazaungdine is held in the eighth month of the Myanmar calendar. Competitions are held to weave special yellow monk robes for two consecutive nights. Buddha's mother, Maya, who had been reborn in the Tavatimsa heaven, spent the entire night weaving yellow monk robes for him. Her sister Gotami continued this tradition and offered new robes annually. A day somewhere in November to December dedicated to U Pon Nya, a famous, prominent and renowned writer, post and playwright. Celebrated in February-March, time of transition from the cold to the hot, with song and literature. Some Myanmar people also made pagoda through river sands.